From simple to complex jobs… one call to Custom Cutters is all it takes! 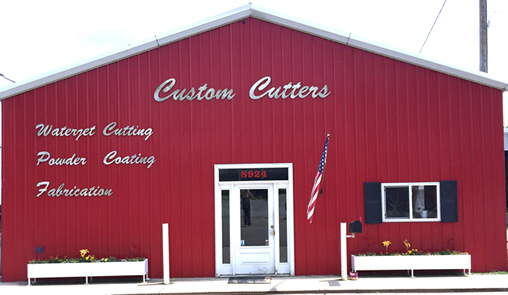 Established in 1998, Custom Cutters is a family-owned and -operated company located in central Ohio. Originally offering waterjet cutting and fabrication abilities to their customers, the company has been able to expand and add many other manufacturing processes over the years. Even with expanding to meet the needs of our customers, we believe that quality control in all stages of design, fabrication, construction, and manufacturing is of the utmost importance. We understand that people are our most important asset. Therefore, treating our employees, customers, and suppliers as we would like to be treated is one of our main priorities. Combined with our knowledge, experience, and progressive technology, we are able to go above and beyond to meet the needs of our customers. Our 16,000 square foot facility allows us to offer multiple services to our customers, making us a one-stop shop. Using state of the art equipment and methods, we are often able to produce items that are difficult or impossible to make using other methods…and at a reasonable price! We understand that some projects require a quick turnaround, and Custom Cutters is fortunate enough to have a dedicated group of employees that also support our dedication to our customers. If you are in central Ohio, please feel free to stop by, tour our facilities, and meet our staff. Whether you are a large corporation or a small hobbyist, we are certain there is a project we can help you complete!